A government program encouraging vehicle owners in Greece to replace older cars or trucks offers an incentive worth up to 2,800 euros through December 2014. Under the so-called cash-for-clunkers scheme, owners receive a discount calculated according to engine size of the car/truck being withdrawn, which is applied toward the circulation tax of a newer vehicle. The car/truck being junked must have been purchased or first registered on or before December 31, 1998 2000 to qualify and have an engine size less than 2000 cc or 2.0 liters. The original program ran from February 21 to December 20, 2011 and was extended through 2012, then 2013. It is hoped that a fraction of 2.5 million qualifying cars in Greece will be withdrawn to reduce emissions and gas consumption; boost state coffers; and rescue jobs and businesses in the auto industry, which has seen more than 3,000 dealerships shut down and new car sales fall 40.1 percent in 2012. The used car sector remains relatively stable, with a small pickup in transfers since austerity. A similar program ran at the end of 2009 but was bureaucratic and revoked after 30 days when 78,000 cars were withdrawn and depleted funds. Those who successfully lodged applications were not required to purchase a new car but were caught in limbo, under threat of having refunds reduced and had to wait months before receiving money. A promise to revise and restart the program was finally fulfilled February 11, 2011 when the joint ministerial decision on 3899/2010 was signed. *Article last updated May 5, 2014. Where to go and what documents/fees are required. Many steps of the process are also applicable to those seeking to junk vehicles of any age without purchasing a new one. Which cars are eligible for withdrawal? b) the car’s/truck’s initial (first) date of registration was on or before December 31, 1998 2000. Cars and trucks need not be in perfect condition but should not be damaged by fire, accident or vandalism. Vehicles with 2,000 cc or 2.0-liter engines or higher do not qualify for the program. All models released in Greece, or cars purchased or registered on or after January 1, 1999 2001 are not eligible. What incentive is being offered? The incentive ranges from 300 to 2800 euros but can go higher in some cases after factoring in registration fees and discounts on luxury tax. Primary calculations are made by engine size. Your discount may be lower or higher depending on other variables, and there is no stated limit on how many vehicles can be junked under the program. No cash refunds are issued to the buyer. It is a circulation tax exemption, processed and applied directly through government offices, i.e., If you are given an discount incentive of 1000 euros for your junked car or truck and buy a new/used car with registration fees of 2500 euros, you will only pay 1500 euros. However, note that dealers in Greece are offering a number of special discounts separate from the program, and it is a buyer’s market so negotiation is expected. Which vehicles may I buy? Any new or used vehicle with an engine size up to 2,000 cc or 2.0 liters may be selected. The environment ministry said it would look into providing additional incentives, but no measures have been announced. The person completing the process may be the vehicle owner or a person designated via certified dilosi by the vehicle owner. Get a βεβαίωσης καταβολής τελών κυκλοφορίας/Bebaiosi katabolis telon kykloforias (Certificate of deposit for circulation tax) from the Greek tax office that says all circulation taxes up to the current year (2013) and outstanding tickets were paid on the vehicle being withdrawn. If the car/truck was taken out of service, get a βεβαίωση/Bebaiosi from the tax office that states the license plates were turned in, all circulation taxes have been paid, and the car or truck was withdrawn. Take the vehicle to an Οχημάτων Τέλους Κύκλου Ζωής/Ochimaton Telous Kyklou Zois (ΟΤΚΖ) company or End-of-Life Vehicle (ELV) company. *Only use those that have been authorized by Εναλλακτικής Διαχείρισης Οχημάτων Ελλάδος (ΕΔΟΕ)/Enallaktikis Diacheirisis Oximaton Ellados (EDOE) or Alternative Motor Vehicle Administration. b) An Υπεύθυνη Δήλωση/Ipeuthini Dilosi (Certified Declaration) that the car/truck is scheduled for destruction or retirement. The Ministry of Transport (YME) office in your region issues two (2) copies of the Πράξη Οριστικής Διαγραφής/Praxi Oristikis Diagrafis (Registration of Final Removal/Retirement). You or your certified representative must pick them up. Select, purchase and register a qualifying new or used vehicle to replace the one you withdrew. The file at the customs office remains open for six (6) months, awaiting a πιστοποιητικό ταξινόμησης του αυτοκινήτου/pistopoiitiko taxinomisis tou autokinito (certificate of registration) bearing the name of the vehicle owner who completed withdrawal. Registration is usually facilitated through the car dealer and nothing more needs to be done. If purchasing a replacement through a private party, you will need to complete registration and change of ownership on your own. If no vehicle is purchased and registered, the incentive is canceled and the applicant pays all associated taxes, fees and fines. 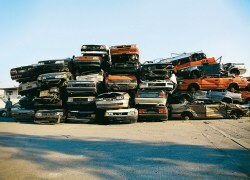 Obviously, you cannot get your car/truck back since it has been scrapped and recycled. d) a driver’s license (see “Converting to a Greek driver’s license” to see if you need one or how to swap). Before turning in everything at the teloneio/customs office, I recommend making a photocopy of everything just in case your file is lost or misplaced and wait for confirmation that everything is final before trashing them. The process for withdrawing and scrapping an old car is projected to take between 13 to 18 working days, but let’s remember this is Greece and your actual experience may vary. When selecting a vehicle, keep in mind that luxury tax is charged on new vehicles costing 20,000 euros or more. Luxury tax on used cars is calculated differently the same, according to Article 23, effective 2013. The reorganization of municipalities and staff transfers under the Kallikratis program is still incomplete and has been disrupted by elections, so the relevant offices may not be fully operational or staffed with people with expertise. — Customers were quoted waiting times of up to 1-2 months, not 1-2 weeks. Because official websites and government circulars almost never match reality, I like to combine all articles with first-hand experience but cannot in this case because our car is not eligible. What I provided is a unique compilation of information translated from all sources listed below. Readers are encouraged to share their experience as a way to give back to the website for the free assistance they received. Wonderful! Let’s support the German car industry! They need it, while Greece is swimming in money. Who cares about the trade deficit anyway? Kat, not criticizing your work here, of course, just the absurdity of these “measures”. You make an excellent point. Another comment I heard was, “Great, let’s stimulate Greece’s auto industry. Oh wait, it doesn’t have one.” I do believe that some of these measures are not fully thought through, since the people most likely to take advantage of this program are people who could afford to buy new vehicles without the incentive. Meanwhile, everyday people have seen their taxes hiked three times in less than a year, and things like public transport tickets have gone up by 40 percent. I didn’t think you were criticizing me or the work being presented. As long as there is no aggression, abuse or name-calling, I’m open to informed differences of opinion and debate. But in this case, we agree. Although we have seen much better funded withdrawal programs in the past and this one seems to be carefully designed to throw a lot less free cash at consumers, it is a measure the country can absolutely not afford at this desperate time and the Troika will hopefully limit as soon as abuses are detected. The limited funds available should be focused at withdrawing/modernizing Greece’s killer truck fleet which is well above the EU countries’ average age (17-18 years in Greece). That would be a true public safety measure, not a consumer give-away like this measure. Others have linked these kinds of give-aways, (paroches) to potentitial off-cycle elections, so who knows? I (Canadian) have a summer house in greece and am registered (pay utilities automatically through the bank), the process described above in order to scrap a vehicle seems rather complex and i have no intention of getting a greek drivers license as i rarely spend over a month / year in greece. I was wondering if i could sell (transfer) my car to a relative and have them apply for the credits I would then purchase a newer vehicle in their name. Has anyone done this and do you foresee any problems? I just discovered you website, It is superb! keep up the good work. It is possible for you to sell and transfer ownership of the car to someone else and have them take part in Greece’s withdrawal program. No rules against that. In response to Oresti, I am in a similar situation as yourself–Greece in the summer, Canada the rest of the year. Old-scrappy car in the driveway. I was wondering if an international drivers permit would do? I have all other documentation (AFM, passport, Greek I.D ). P.S. Kat—you make the world a better place. I got an offer I can’t refuse on a very good second hand car. Can I buy that one already and do all the steps required to scrap my old one later? And where can i find the registration fees for the new (second hand) car as mentioned in the article? If the offer came from a dealer selling the second-hand car, ask them if you can use your old one as part of the trade and they’ll (usually) take care of it. If the offer came from a private party, then you can scrap your old one another time as long as the program is still in effect. Registration fees are calculated by the dealer or Ministry of Transport when the new owner is recorded. I do not have an article for it and have no plans to write one at this time. Nice to hear from you again. All best. Hi I’m not sure that I’m in the right place to ask, but couldn’t find find a search. I am trying to sell my moped, please could you tell me what paperwork I need ( + buyer) and where do I go and what the process is. Many thanks. Because articles combine official documentation with first-hand experience, I haven’t covered this subject as no one I know has ever sold a moped. If anyone takes detailed notes and contributes their experience, I’ll turn it into a how-to post for everyone. If you’re a/an UK/EU citizen, you could try searching at livingincrete.net. Otherwise, go directly to a Ministry of Transport office to inquire.